"How to upload YouTube videos fast? I am a 'you-tuber' and I recently made a video about 10 minuets long with a HD camera and intend to post the video to YouTube that way. The file comes in 7GB. When I try to upload to YouTube, the process mostly stalls out at 8%. Are there any limits I should know about? I've already tried the trick to allow me to share videos longer than 15 minutes, but it hasn't helped. Any help?" "What is the YouTube video upload limit on file length? I published a 21 minute video and at first it did okay and it had the "Video is processing" page, but now it has the 'This video has been removed because it is too long' page." "I have created a 7 minute video in 1080p. The size of the file is within the size limit but I get an invalid file format error message says I can't upload video in this format. How to fix it?" 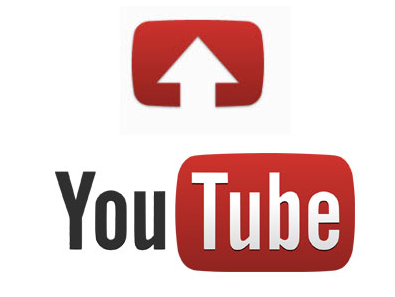 YouTube, as the leader video sharing site, provides users the freedom to share videos with friends and strangers. According to the statistics, 100 hours of videos are uploaded to YouTube every minute, that's more than 6-hour output of the top three American TV networks. However, when we try to put video to YouTube, the site may return with the above annoyances. First of all, you are suggested to make yourself familiar with the limit specs such as the video size, length, formats etc and learn the easy solution. Facebook upload limits on size length, etc. The videos that users try to upload to YouTube may be rejected for many reasons, and first comes the YouTube video size. YouTube allows standard accounts to upload videos up to 2 gigabytes, that's equivalent to HD video with lengths of less than 10 minutes. YouTube upload size limit is waived for partnership accounts. Tips: If your video is too large to be allowed to post to YouTube, you can just turn to a YouTube video uploader to compress your video into video formats with smaller size like FLV, AVI, 3PG etc. Following the video size limit comes the limit on video length. Since 2010, YouTube has increased its allowed video length to 15 minutes. This move is to match up with 2 gigabyte YouTube size limit as well as to respond the most-asked request from users. However, no length restrictions are set for partnership accounts who can freely upload videos of any size and length to YouTube. Tips: Also a good video converter can help you cut and trim your video into the ideal length while keep all the highlights as you want. Note: MP4 is suggested by YouTube as the best video format which can produce the best video quality and can easily meet the YouTube upload size limit. 16:9 aspect ratio players are used on YouTube. If your video is not a 16:9 file, it's OK as YouTube will automatically expand the video the fill the screen. However, if you want to fit the screen perfectly, you may adjust the video size to suit the limit. This size is accompanied by a recommended resolution of 320x240. You are suggested to share video in the natural frame rate it is recorded or made. However, you can also change the frame rate to avoid odd video effects. As for the bitrate, as there are not that strict limit on it, you can focus more on the video format, size, resolution, length limits etc. According to YouTube, H.264 is the most commonly used codec in YouTube videos. How to publish video to YouTube faster with good quality? This codec can help. Besides, other codecs are also compatible with YouTube like VP8. Now you may have a whole picture about the limits imposed by YouTube. But how to publish without worrying about those limits? Never mind, you can just make a YouTube video which suits all the YouTube upload limits with a proper YouTube video converter. To save your time and energy seeking for a reliable video converter, here MacX Video Converter Pro is highly recommended. This YouTube video converter allows users to convert and edit any video, be it SD video, HD camcorder recorded video, Blu-ray video, DVD video etc, and be it in any format like MKV, AVCHD, VOB and many more, to the above format, resolution, size, length etc required by YouTube. To put it differently, with this YouTube video converter, you can bypass all the limits on videos. Step 1: Download and launch the YouTube video uploader for Mac, load the video you'd like to share by hitting "Add File" button. 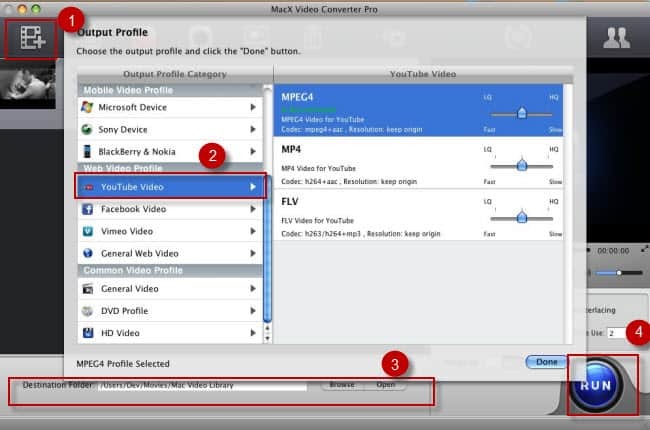 Step 2: Select a format for YouTube as the output format such as MP4, FLV, AVI, WMV, 3GP etc. And tweak the parameters of the output video like resolutions, size, aspect ratio etc. Or you can choose "to YouTube Video" directly. Step 4: Click the "RUN" button to remove the YouTube publishing limits. Then you can start the process of uploading videos to YouTube. For your reference: After sharing, you may also want to download some videos for offline enjoyment. As a matter of fact, this YouTube video uploader also supports downloading any SD and HD movies and videos from YouTube and convert them to countless video formats, MP4, MOV, AVI, FLV, WMV, MKV, AVCHD, MTS, 3GP etc or various popular devices like iPhone X/7/8/6 (Plus), iPad Air 2/mini 3 Retina, Galaxy Note and many more with original quality reserved.